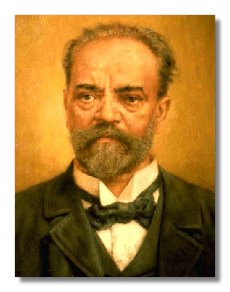 Contrary to legend, Antonín Dvořák (September 8, 1841 - May 1, 1904) was not born in poverty. His father was an innkeeper and butcher, as well as an amateur musician. The father not only put no obstacles in the way of his son's pursuit of a musical career, he and his wife positively encouraged the boy. He learned the violin and finally was sent to the Prague Organ School, from which he emerged at age 18 as a trained organist and immediately plunged into the life of a working musician. He played in various dance bands, usually as a violist. One of his groups became the core of the Provisional Theater orchestra, the first Czech-language theater in Prague, and Dvořák was appointed principal violist. Around this time, he also began giving private piano lessons, eventually marrying one of his students. During this early period, he composed a ton of music, learning how through studying scores mainly by Mozart, Beethoven, Schubert, Liszt, and Wagner. At first, his music resembles that of Mozart, Beethoven, and Schubert. The quality varies in this music, as you would expect, but the sheer amount of it impresses you. Furthermore, if some of it shows awkwardness, it also shows imagination and inventive tunefulness. In addition to songs and miniatures, you find a great deal of chamber music, at least one opera, and a concerto. Toward the end of this apprenticeship, Liszt and Wagner dominate, although Dvořák still tries to contain them in classical forms. The big work of this phase is the Symphony No. 1, which the composer thought had perished in a fire. In later life, he told his composition students that he had irretrievably lost his first symphony, his students asked anxiously, "What did you do?" "I sat down and wrote another one," he replied. Fortunately, it turns out that this composition wasn't lost, merely misplaced, and we can now hear this milestone in the composer's development. The Wagner phase, however, was brief, about five years. It permeates the opera The King and the Charcoal Burner (1873). The opera was taken off the schedule of Prague's Provisional Theater, due to rehearsal difficulties. Far from sinking into discouragement, Dvořák began a thorough reassessment of his artistic direction, finding his mature path of combining Czech folklore with classical forms. He revised The King and the Charcoal Burner, resubmitted it to the theater, and enjoyed a successful premiere in 1874. Other major works of this period include the Stabat mater (1877), the symphonies 4-6, the serenades for strings and for winds, the violin concerto, and the enormously successful first set of the Slavonic Dances. In 1874, Dvořák applied for and received a grant from the Austrian government. He applied successfully three more times. Apart from easing Dvořák's financial stress, the grants also brought him to the attention of Brahms, one of the members of the jury. Brahms immediately became a fan and persuaded his own publisher, Simrock, to take up Dvořák's music. Thus began Dvořák's career outside Czechoslovakia. He certainly became the big musical deal within his home country. Part of the spread of his music derives from Austro-German politics of the time. Bans were placed periodically on performances of Czech composers within the Austro-Hungarian Empire. Scheduled performances of major works like the Sixth Symphony were cancelled in Vienna. However, in 1883, Joseph Barnby invited Dvořák to London to conduct his Stabat mater. The British went crazy for the music, and Dvořák's international career dates from this visit. He returned to England eight more times. His reputation was large enough to attract the notice of George Bernard Shaw, one of the finest of all musical critics. Unfortunately, Shaw disliked Dvořák's music for many of the same reasons he advanced against Brahms. In 1889, Dvořák became a professor of composition at the Prague conservatory. His best student was undoubtedly his son-in-law, Josef Suk. As a teacher, Dvořák was no wizard of technique. In fact, he insisted that his students have a finished technique before he allowed them into his class. He would criticize student scores, put his finger on weak passages, and in general treat his pupils as colleagues, insisting that they find their own way, as he had found his. Jeannette Thurber, a wealthy American music patron, in 1892 offered Dvořák a position as artistic director and composition professor at New York's National Music Conservatory, at a salary of $15,000, twenty-five times what he got in Prague. It was also clear that the Americans expected him to help pave the way for an "American" musical style. Dvořák took this last charge to heart. This inaugurated Dvořák's "American" phase, which produced his Ninth Symphony "From the New World," the String Quartet #12, the cantata The American Flag, and the String Quintet in Eb. However, financial advantage and high artistic purpose competed with simple homesickness in Dvořák's soul. Summer vacations among the Czech-speaking community in Spillville, Iowa, helped, but the longing to return to Prague grew. 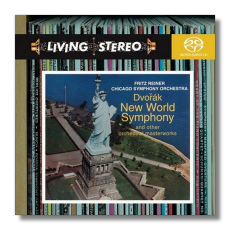 Dvořák wrote almost as many works celebrating his native country as those which hymned the New World: for example, the Te Deum and the cello concerto (one of the best for the instrument). Furthermore, Dvořák had become increasingly interested in streamlining classical forms. In the 1880s, he had entered a so-called second nationalist phase, in which Czech folk elements are completely absorbed and put in the service of Dvořák's formal experiments. The image of Dvořák as some spontaneously musical "holy fool" doesn't hold up in the presence of scores full of formal sophistication. 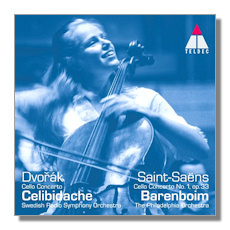 The cello concerto, for example, provides an heroic part for the cellist without burying him in the orchestral mass. Examination of the score reveals tremendous planning to unleash orchestral power while keeping the orchestra out of the way of the soloist. No less a composer than Brahms, who had written his double concerto in 1887 in part as a solution to the problems of the cello as solo instrument, exclaimed, "Why on earth didn't I know that one could write a cello concerto like this? If I had only known, I would have written one long ago!" A major economic depression in the 1890s reduced the Thurber fortune. She felt she could no longer keep her commitment to pay Dvořák's salary and indeed owed the composer money. Dvořák and his family returned to Prague. This inaugurated Dvořák's final period dominated by tone poems (The Water Goblin, The Noon Witch, and The Golden Spinning-Wheel, among others) and opera (Rusalka, The Devil and Kate, and Armida). Dvořák considered himself primarily a dramatic composer, although, so far, few have agreed with this assessment. He wrote more operas (11) than symphonies, but only two – Rusalka and The Devil and Kate – have been staged with even minimal frequency outside Czechoslovakia.